“Memory is tied to history and identity. It affects integration and makes boundaries pores. It’s at the core of a shared experience of generations throughout” time and through storytelling”. “Memories change our identity. They can be associations with our childhood. They are also what we’re taught to be our history. But sometimes histories can be lost”. “Memory is a carefully curated memory. It’s a construction of the past and an interpretation. In times of populism, memory is intrinsically linked to the irrational”. “Memory can mean re-tracing. It can mean going through left over after the creation of a filming it. There’s a difference between re-enactment and re-tracing. Between documentation and embodied forms of memory, between habitus and the instilling of memories in the body. It can also be emotional states and affect”. 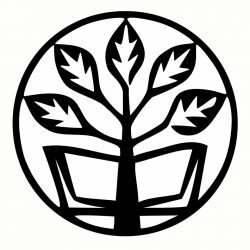 Memory as the narrative in the learning and building memories. But it can also be what programmes how we communicate. Memory is what is precious to us and what we choose to select. 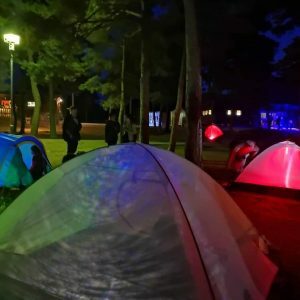 The glowing tents were easy to notice between the pine-trees during the mini-festival in NSU. Those were “In-tents-intervention” by Annikki Wahlöö, Benedikte Esperi and Cia Runesson, each of them intervened one tent, where they created personal participatory performances, related to the subject of artistic research. By indirect tools and metaphors, they triggered in every visitor a chain of thoughts and associations reflecting on own attitude and methods in the artistic research. The queueing visitors could lay on the blankets between tree tents and continue the flow of reflection with each other, the other left for the performance of Tuuli Mall “Mersong – sea water, hot summer and no more legs for walking”, where from the positon of the mermaid, the performer made an artistic comment on the common experience in NSU (hot days and water shortage warnings) and on the global reasons behind these local conditions. 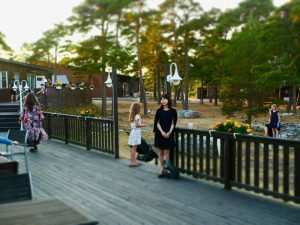 The performance was an intervention in the space of sauna and included usage of the authentic sea-water brought directly from the beach of Fårö. Alma Meretoja has the confidence it takes to get to Carnegie Hall. 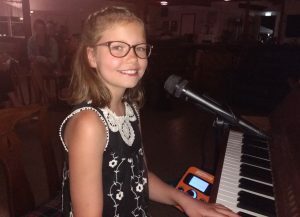 Alma expressed her feelings using piano and song in front of a gathering of all those not at the general meeting, including her mom and dad and brother. The 11 year old composed four pieces for the piano and wrote lyrics for two of them. The piano as a means of expression started for Alma when eight years of age. Once smitten, Alma shifted from a private tutor to a Conservatoire, where she was able to explore the advantages of sharing her interest in music with others. Alma had performed at the conservatory before but this performance was the first to an outside audience. To the obvious pleasure of her proud parents, and a supportive brother, Alma sang and played faultlessly and elegantly to around thirty delegates and workers, silently listening to the soulful notes and phrases, then applauding enthusiastically. A triumph. I asked Alma how she had such sorrow to express, especially since her family, and indeed Alma herself, seem full of life. Alma thought for a bit, and said that the piano, and the wish to express things that she could not alter in her life, yet affected her, came together in the way we had now shared this evening. The sort of situations many kids face, friends in different classes and the absolute difficulty of finding other kids with similar interests to share time with. Personally, I hope Alma’s way of dealing with sorrows finds a way through to the obvious well of sheer enjoyment she could not suppress whilst waiting in the wings, prior to the performance, and after during this interview. Alma is young, extremely capable, well supported, and if she so chooses could continue to delight audiences with, as she puts it, “the power of art and imagination”. “So I kinda expected it would be harder. I had looked after so many kids at birthday parties, they were always hard to please. I could manage well, but there were always odd ones out. Here it is easier because I am not alone. There are five others working with me. we can split the group so I can do what I am good at doing and others can do other stuff. We look after 20 kids. It demands teamwork. We did plan the first day but we soon had to improvise and ended up not following the plan. The kids raised issues and so new measures were required. I went outside and played hide-and-seek with some of them. I have never been “it” so many times. We played that game over and over again. That was fun. But then we played hide and tag with no home, so the kids could run and run, and I had to keep chasing them. That was really exhausting. But other times we might for example do more relaxing stuff like drawing. I really like the environment we are in. In a village there are all sorts of problems about safety but here it is flat and grassy. And there are trees. I do find it interesting that the trees are not just bushes like they are at home, bushes or small trees. Here the trees are much taller, and there are no mountains in the background like there are at home. Here, one day we took the kids to the sea, once we knew it was safe. Each day we find stuff to do and make it work for all of us. We do have a break at lunch time when the kids go back to their parents and then of course they go back when it’s time for dinner. So we are looking after the children in the mornings and the afternoons. In the morning sessions most of the children are super energised but thankfully in the afternoons they seem to be much more relaxed. Obviously some kids will enjoy this sort of situation more than others. Sporty kids, and those who like playing hide and seek. Also those who like playing cards and Creative Kids. Some made light savers improvising with what we could find. In fact being creative is very helpful. Then again some kids just like lying in hammocks. Overall activities are outdoors. We didn’t have video games and that seems kind of a good thing not to have such things, maybe some parents have kids who would like to play on computers so that’s something to think about. But we do not teach that is a teacher’s job, and we do not do manners, that is the parents job. and if a child is unwell, we take them straight to their family. Fårö is an island of small pine trees, dark green vegetation (now with yellow tones because of the draught) and a strong light that bounces off it’s white stone. The people of Fårö are even able to cultivate vegetables with a yellow alga used on a stone field as a fertiliser. Ingmar Bergman had been looking for the perfect location in the 60s for his films all over Sweden and when he visited the island it was love at first died. Not only did he film four of his films here but he also chose to have his second home. He was buried in the church cemetery after dying in 2007, beside his late wife Ingrid. Bergman involved the people in Fårö in most of his films and developed a relationship with the locals throughout his life. Another one of his wives in earlier live, a Finnish pianist, had a house in front of his and came back every summer even after they separated. He married six times and had a child with each of his wives. 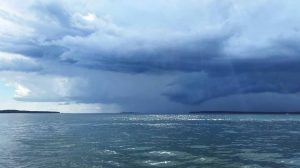 Fårö’s ferries have women’s names. There is a story for each one of them. 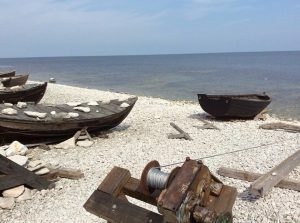 The people in Fårö have been consulted several times if they would like a bridge to join them with the larger island of Gotland but they’ve never wanted to. Sea traffic control can often be strict, and it would mean more people and cars easily coming in and out of the island. 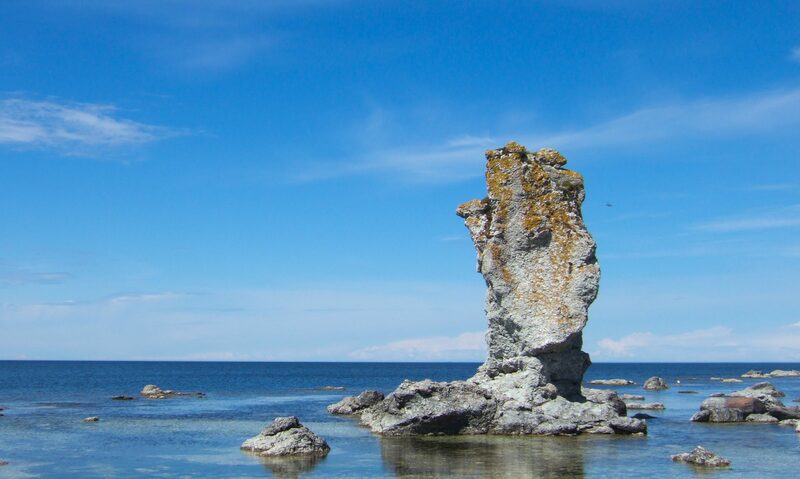 Fårö’s limestone sea rocks come from formations of the equator during the Ice age, over four hundred million years ago. Minerals found in the island are of high value and there are 35 names for stones that are unique to here. There is also a type of sheep unique to Gotland that exists in the wild here in Fårö. 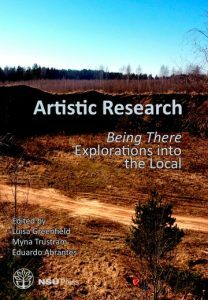 For some of the participants of NSU summer session the day off could have been be spent with the book: with the new anthology from the Circle 7 “Artistic research. Being There. Explorations into the local” https://en.unipress.dk/udgivelser/a/artistic-research-(1)/, which were presented on Wednesday evening by the editors and contributors. Writing about artistic research is already a form of art practice. The contributors of this book are dancers, performers, filmmakers, writers, sound-artists, historians, philosophers, theorists and painters. While English id the common language of Nordic University the native languages of the contributors are Polish, German, Swedish, Norwegian, Portuguese, Finish and English. The editors are American woman living in Berlin, a Portuguese man living in Copenhagen and British woman living in Stockport, England. None of them is Nordic, but they are deeply involved in the long-standing Nordic organization. “The interdisciplinary aspect is underdeveloped; it is very clearly situated in the discipline of social work”. Social Work is in its character interdisciplinary. It draws upon: Sociology, psychology, political science, law and methodology in social work. Depending on the social problem in focus, social work can also draw upon: e.g. health science, anthropology, ethnography, physical planning (Spatial approaches to social work) and globalization. So we think that our proposal meets the demands of an interdisciplinary aspect. Who Will you be and Why? Before arriving, the answer to this question would seem so simple: “Of course I will be (insert academic profession here) because this is my title or due to my previous experience”. After meeting so many unique minds in circle discussions, informal coffee break conversations, and passively strolling around the host site, this question might be more difficult to answer. The first day, I wanted to be a yoga instructor and take pride in knowing that I at least helped others to relieve stress from travel and prepare for a week full of new information, topics, and experiences. Later that day, the notion of becoming a citizenship teacher who could make a difference in how young people understand and actively participate in democracy became extremely important during a lecture on support for different political leaders. Then in the evening, the Jazz and Folk artists inspired me to consider taking up musical expression with their intermittent explanations of the historical significance of the songs they performed. The whirlwind of possible futures continued the next day when video representations of Iranian women living in Finland by Sepideh Rahas made it clear that art and film were a meaningful way to impact social change. A few hours later however, the tragic experiences and knowledge shared by keynote speaker Jason de León emphasized how, as an anthropologist, I would be able to investigate and aim to understand real life situations. Sports instructor, teacher, musician, artist, anthropologist, or researcher? As the week progresses, there is no doubt that this list will grow. We all have the potential to be many professions, but who says we have to choose and identify with just one? The greatest takeaway from reconsidering “who I want to be when I ´grow´ up” could be a reminder of the diverse resources and perspectives continuously available for us in any field we may choose. The NSU is like a little microcosm and a little model of society functioning on the principles of good and free will and desire to participate and contribute on a voluntary basis. Or, as one of our Circle participants formulated it, the NSU is a model of cooperative – an autonomous association of persons united voluntarily to meet their common goals, needs and aspirations. I have had experience in various positions in the NSU. I started as a participant in Circle 2 winter session, which took place in Riga. I helped the coordinators to book a local restaurant for the Circle’s dinner and it turned out a nice evening of socializing and networking. When it was decided that the NSU summer session would take place in Latvia in the upcoming year, I was approached with the proposal to be the Head of Arrkom, so I was reunited with the NSU family again. 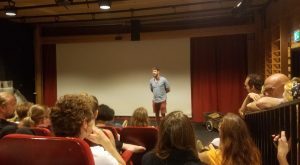 After the summer session I took over the responsibility of a Circle’s coordinator from the previous coordinators of Circle 2, and thus I could experience a different aspect of the organizational work again. This experience has provided me with different insights within the NSU. For example, in this summer session I have an opportunity to explore the political culture of the NSU, since I am a delegate at the General Assembly of the NSU. It is a useful exercise of agency and citizenship in an organizational model, which I otherwise would probably never experience, unless I become a member of parliament. To be a circle coordinator, first of all, one must have good people skills. Not only the overall NSU policy is to support the interdisciplinary approach in research and networking, it is also the cross-cultural aspect that the coordinators must deal with when coordinating Circle’s work. So, above all, coordinators should have empathy and communication skills to support the existing and prospective participants in all kinds of matters, both virtually and in person. What I really enjoy in the process of conducting and organizing a Circle’s work is the great platform for communication and exchange of ideas that emerges during the summer and winter sessions. All the sessions of our circle have been very inspirational and thought-provoking in this sense. Since I am a researcher myself, I have very often experienced isolation and lack of human contact. So I really appreciate the collective and shared experience, as well as the sense of community that these symposia offer us. However, a circle coordinator should also know how to find the balance between being the good cop and the bad cop or, in other words, the psychological tactic when heated debates need to be regulated in group discussions. I would say it is some kind of helicopter view, when a coordinator has the ability to zoom out of the smaller details and offer an overall conclusion to wrap up the problem and without restricting or offending the group to move on. In general, the experience of a coordinator is very valuable. It has been a learning curve for me in all kinds of disciplines: rational and emotional intelligence, communication, strategic and critical thinking, organizational work and even finance management. Which persona are you watching? Even for those of us who are not a cinephiles, seeing a new movie can be a unique human experience. Especially when we have the chance to see an Ingmar Bergman film on the island where the movie was shot fifty-two years ago. Add to that eighty NSU attendees from all walks of life sitting in a hall meant for sixty (with emergency exits open for safety purposes) to watch the full eighty-three minutes of “one of the most daring movies ever made”, and you have a real anthropological opportunity. After eating the Maria cookies (which were Bergman’s favorite alongside sour milk), spectators filed into the cozy screening room and found their place in a chair, on the steps, or along the wall. The movie theatre itself had a personal connection for the center coordinator who explained that the very room in which we were about to watch “one of the 100 movies that shocked the world” used to be the gymnasium of his former school. The reminiscent rafters of a school gym reminded the audience of the contrast between the provoking storyline of the two ‘persona’ and their physical environment. Somehow it seemed that everyone forgot for at least part of the movie that they were sitting in a slightly crowded room, sprawled on the side steps or standing along the wall. Some sat with their hands folded in front of their faces on the edge of their seats and some leaned back to take it all in. While the audience’s eyes were on the film, the eyes of the main character seemed to stare back. 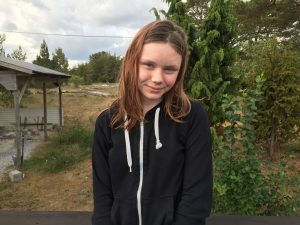 One of the most powerful (even if not the most provocative) moments was when Sister Alme first describes Elisabet as having “a face like a child, yet severe eyes”. This was the beginning of many interpersonal and intra persona struggles displayed on screen and extended in a ripple through the audience with Elisabet’s extended gaze into the camera.